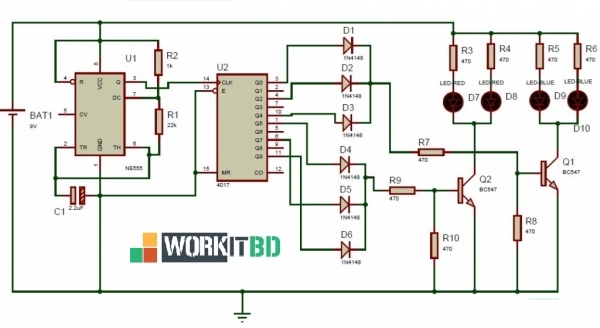 This circuit simulates the police car lights by alternate flashing. This circuit flashes red LEDs for three times and blue LED’s for three times. This flashing action performs continuously. This circuit uses 555 timer and a decade counter. Here, 555 timer runs in astable mode. Decade counter 4017 counts the incoming pulses that is for first pulse Q0 becomes high and for second pulse Q1 becomes high and so on again for 10th pulse Q0 state becomes high. Here 555 timer produces continuous pulses via pin 3. The width of these pulses can be varied by varying the resistance (R1,R2 ) or capacitance (C1). These pulses are given as input to the decade counter. For every incoming pulse the output state of the decade counter is get incremented. Hence blue led’s flashes for 3 times. Hence red LEDs flash for 3 times. This process repeats continuously. 555 Timer: Here 555 timer runs in free running mode. It produces pulses whose width can be varied. 2nd and 6th pins are shorted to allow triggering after every cycle. 4th pin is connected to Vcc to avoid sudden resets. 4017 Decade Counter: It is a 10 bit counter with ten decoded outputs. It counts the incoming pulses. The supply voltage range is -0.5 to +22V. The high pulse on the reset pin clears the count to zero. The speed of operation of this IC is up to 10 Mhz. The ouput states (Q0,Q2,Q4) are ORed to flash the blue LED’s 3 times and the states Q5, Q7 and Q9 are ORed to flash the red LED’s 3 times. Based on the outputs of 4017 IC, two transistors (NPN) switches the LED’s ON and OFF. Resistors R3, R4, R5, R6 are used to protect the LED’s from high voltage. Now observe the LED’s, red led’s flashes 3 times and blue led’s flashes 3 times and this process repeats. If you want to set the different time delays for LED’s then vary the resistance (R1, R2) or capacitance (C1). This circuit used as an indicator for police cars. We can use it as LED flasher circuit by making some modifications. The values of the resistors R1, R2 and capacitor C1 should be same to get perfect flashing.